Gorgeous sunsets are one of the few universally shared human experiences. As the Sun sinks to the horizon, the sky becomes awash in fiery tones of yellow, red and orange. 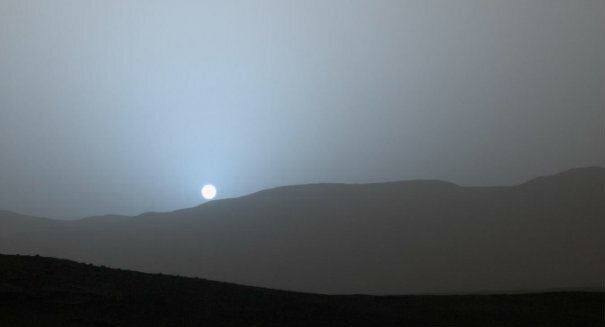 That’s the case here on Earth, at least – on Mars, it’s not uncommon for sunsets to take on a haunting blueish hue, as evidenced in this sequence of images captured by NASA’s Curiosity Rover. It seems odd that what we consider the “red planet” (though it really isn’t) would have blue sunsets, but it’s important to keep in mind that our planet’s atmosphere is responsible for the way light comes to us. The sequence of images was recorded using Curiosity’s Mast Camera on April 15 of this year. The images were taken between dust storms, though enough dust remained in the atmosphere to produce the blue tones. Far from just sightseeing, Curiosity’s sky watching endeavors help scientists gauge the levels of dust in the Martian atmosphere. Interestingly enough, Curiosity’s Mast Camera was designed to see color in much the same way humans do, though it’s actually a bit less sensitive. In other words, seeing the sunset with your own two eyes would be even more spectacular. It’s not just dust itself that creates the blue light, but the size of the dust, specifically. Martian dust is smaller and finer than the stuff we wipe off the tops of our bookshelves, and happens to be the ideal size for absorbing the blue light wavelengths while allowing the red ones to proliferate across the sky. That explains why Mars’ surface looks red when viewed from above, and also why the sunset looks blue when viewed from the ground on Mars. Because of the difference in dust size, we get the opposite effect on Earth – a blue planet from afar, and fiery red sunsets from the surface. Curiosity has been exploring Mars since August 2012, and is still going strong.